Should You Twist the Left Foot and Ankle in the Golf Backswing? 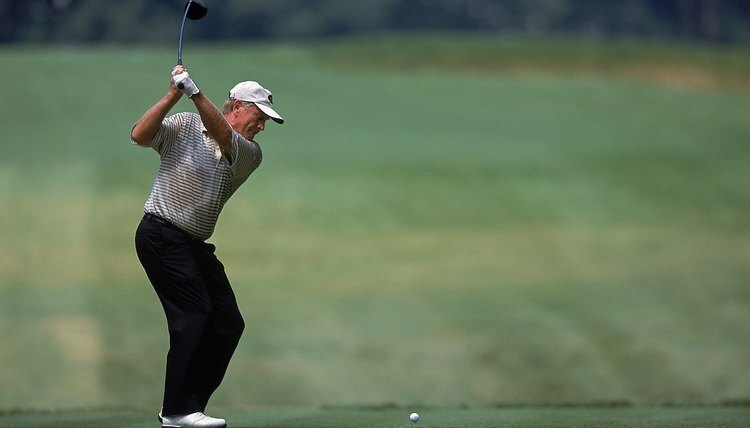 Jack Nicklaus flexes his left knee during his backswing, forcing his left foot and ankle to turn along with the knee. The golf swing involves numerous moving parts and almost every joint in the body. The left foot and ankle (for a right-handed golfer) aren’t typically areas of focus. But their movements may demonstrate whether other parts of your backswing are working as they should. A bit of left foot movement may also help some players add power. Jack Nicklaus says the lower body joints -- hips, knees and ankles -- should “all work together in creating power.” While the hip rotation receives most of the attention from golf instructors, Nicklaus says it’s important for the left knee to turn inward during the backswing to aid the hip rotation. As the knee moves to the right, the left ankle must also twist a bit to the right. In addition to moving along with the knee, the left foot and ankle must twist a bit more when a player lifts his left heel during the backswing. Golf writer Steve Newell says lifting your left heel during the backswing may help a golfer make a complete turn. He says this motion is particularly beneficial to less-flexible players. With your weight shifting to your right side during the backswing, a player who lifts his left heel typically balances briefly on the right side of the left foot. Newell offers two drills for managing left heel movement. One will help you lift your left heel properly. The other will help you ensure that the left heel remains flat. If you want to lift your left heel during the backswing, take your stance and then execute your normal backswing. Stop at the top of your swing while keeping your left heel flat on the ground. Take note of your hand position, because this is the moment when you’ll move your left foot to raise your heel. Ideally, Newell adds, your left foot movement should flow naturally along with your body turn. To practice keeping your heel flat, take your normal stance, but place a golf ball under the toes of your left shoe. Take some practice swings. You’ll be forced to keep your left heel flat to maintain your balance. You can even take a few practice shots with the ball under your foot to reinforce the lesson.